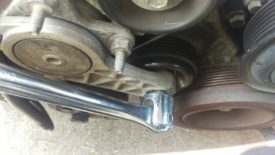 Posted 1 year ago on Friday, December 1st, 2017 by James S.
The 99 Mustang GT had a squealing serpentine since I bought it. Usually, this means it simply needs a new belt, but the previous owner had tried that already. I put a new one on myself and sure enough, it still made noise. 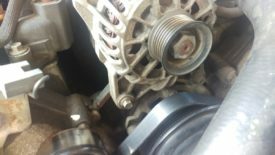 The issue turned out to be the belt tensioner. It was worn out and wasn’t putting enough tension on the belt, causing it to slip. Fortunately, 96-04 Mustang belt tensioner replacement is really easy. The same basic steps should apply to all 4.6 engines, although part numbers for the tensioner and belt vary slightly. 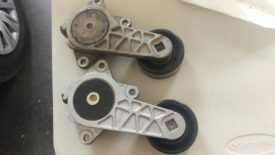 The belt tensioner is best removed with a 3/8″ breaker bar. The tensioner has a 3/8″ square fitting directly on it, no socket required. I use this 17″ one from Harbor Freight. (Be aware that that particular one is expensive on Amazon, but 1/3 the price at Harbor Freight stores.) You can also use a 3/8″ ratchet , but I found it tough to get enough leverage. You will likely still want a decent basic socket set to remove the tensioner bolts. A good socket set comes in extremely handy for all kinds of automotive repairs anyway, so I think it’s a worthwhile investment. 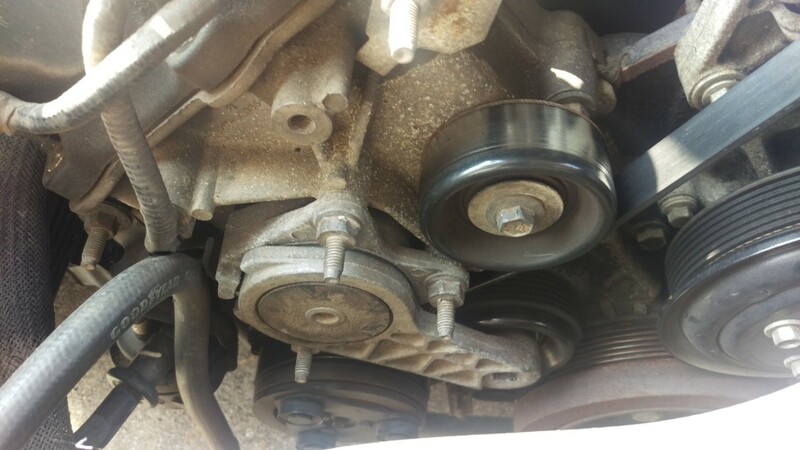 You also need a new belt tensioner of course. The linked tensioner is for 96-99 4.6 Mustangs with 3 studs near the tensioner. Newer 00-04 4.6 Mustangs will require the later tensioner design that has one bolt hole . 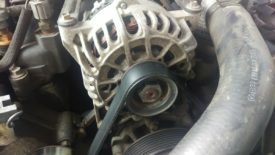 If your belt is squealing, you likely want a new serpentine belt as well. (96-99 GT/Cobra and 00-04 GT are different lengths). 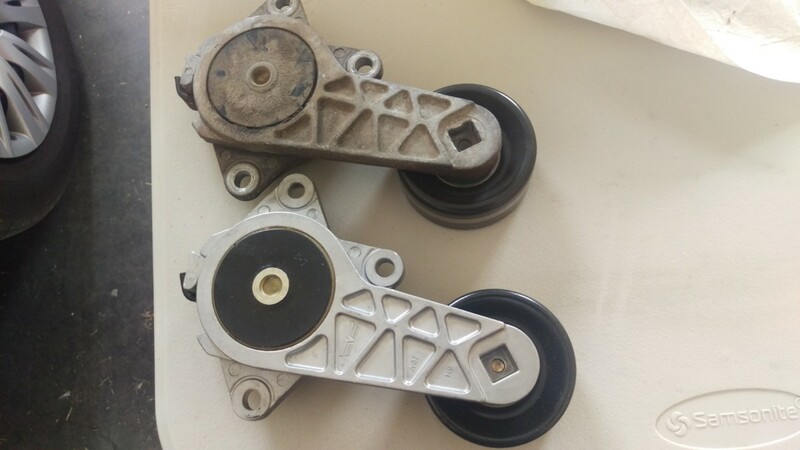 Optionally, you can replace the other idler pulleys . The belt tensioner and serpentine belt are both at the front of the motor. If you pop the hood, you can look down and see them. 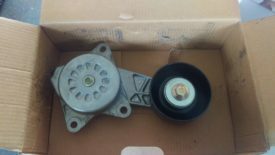 There is also a separate idler pulley above the tensioner assembly you can replace as well, if yours is making noise. The front of the tensioner assembly has a 3/8″ square socket hole, as pictured. Put the 3/8″ breaker bar mentioned earlier into the socket hole. Before doing this part, be sure to pay attention to how the belt is routed, so you can replace it correctly later. The breaker bar can now be used to relax the tension on the belt. Simply pull up on the bar, and the belt will have a few inches of slack. While holding the belt slack with the breaker bar, I slipped the belt off the alternator pulley as shown. Once this is done, the breaker bar can be released and the belt, now loose, can be pulled off. 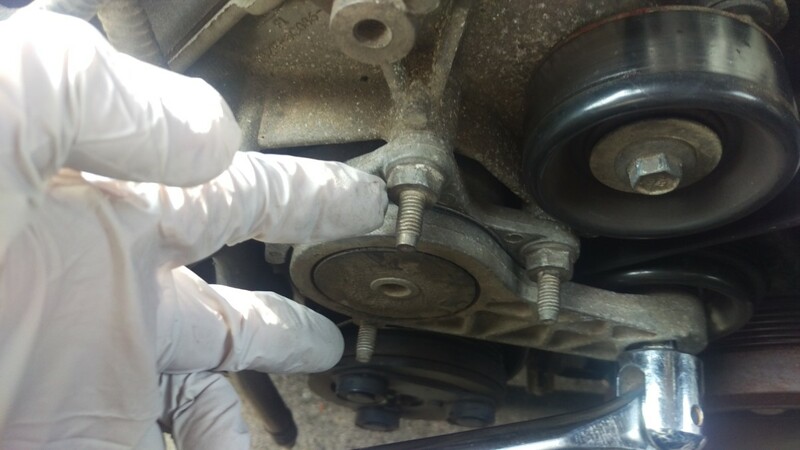 If you want to replace any of the other idler pulleys, now is the time to do it. I chose not to. Pulling the belt back off again later is very easy. Once the belt is removed, the tensioner can be unbolted. On a 99, it is held on by these three studs. Ideally, the nuts will come off of the studs when you put a wrench to these. For later models, there should be a single bolt holding it on. The principle is the same either way. If you’re like me and your belt tensioner is almost 20 years old, you’ll probably have this happen instead. The nut and stud are corroded together, and the stud came out with the nut as one piece. This looks like a bolt, but it isn’t. The right way to fix this is to break the nut free of the stud, reinstall the stud, and then put the nut back on. 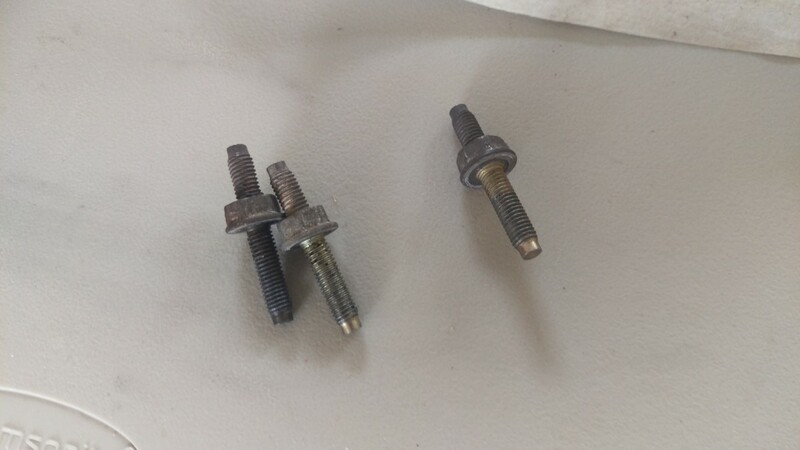 I knew the torque on these bolts isn’t critical, so I opted to skip that and simply reinstall these as though they were bolts. Here are the old and new tensioners, in the orientation they are reinstalled. At this point, reinstallation is the reverse of removal. The new belt tensioner goes back on in place of the old one. As stated earlier, torque isn’t critical on the three mounting studs, so I just got them snugged up firmly. The manual says 15-22 lb-ft, if you’d rather use a torque wrench. This torque range should be appropriate for all 4.6 mustangs. Then, reinstall the belt as it was before removal. Reinsert the breaker bar, pull up, and slip the belt over the alternator. Easy enough. 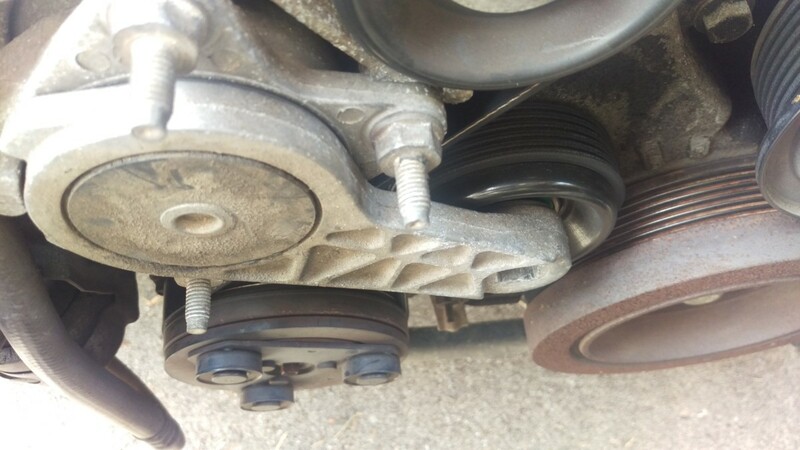 On my car, the increased tension from a new belt tensioner with a fresh spring immediately fixed the startup squeal I was hearing, and it hasn’t come back.